Human IL6 SimpleStep ELISA® kit (ab178013) has been re-developed with new capture and detector antibodies. We have identified new recombinant monoclonal antibodies to use in the SimpleStep ELISA platform that provide a higher sensitivity when quantifying IL6 in human serum, plasma and cell culture supernatants. All orders placed after 11th December 2017/Lot number GR3193751-2 will be fulfilled with kits containing the new recombinant antibodies. IL6 in vitro SimpleStep ELISA® (Enzyme-Linked Immunosorbent Assay) kit is designed for the quantitative measurement of IL6 protein in human serum, plasma and cell culture supernatant. Interleukin 6 (IL6) is a cytokine with a wide variety of biological functions. It is a potent inducer of the acute phase response and plays an essential role in the final differentiation of B-cells into Ig-secreting cells. IL6 is involved in lymphocyte and monocyte differentiation and IL-6 induces myeloma and plasmacytoma growth as well as nerve cells differentiation. B-cells, T-cells, hepatocytes, hematopoeitic progenitor cells and cells of the CNS are all responsive to IL6. IL6 is discharged into the bloodstream after muscle contraction and acts to increase the breakdown of fats and to improve insulin resistance. Our Abpromise guarantee covers the use of ab178013 in the following tested applications. Standard curve comparison between the previous Human IL6 SimpleStep ELISA® kit and the re-developed Human IL6 SimpleStep ELISA® kit. The re-developed kit shows increased sensitivity. The concentrations of IL6 were measured in duplicates, interpolated from the IL6 standard curves and corrected for sample dilution. Undiluted samples are as follows: serum 50%, plasma (EDTA) 50%, and plasma (citrate) 25%. The interpolated dilution factor corrected values are plotted (mean +/- SD, n=2). The concentrations of IL6 were measured in duplicates, interpolated from the IL6 standard curves and corrected for sample dilution. Undiluted samples are as follows: Stimulated PBMC Cell culture supernatant 1:200. The interpolated dilution factor corrected values are plotted (mean +/- SD, n=2). 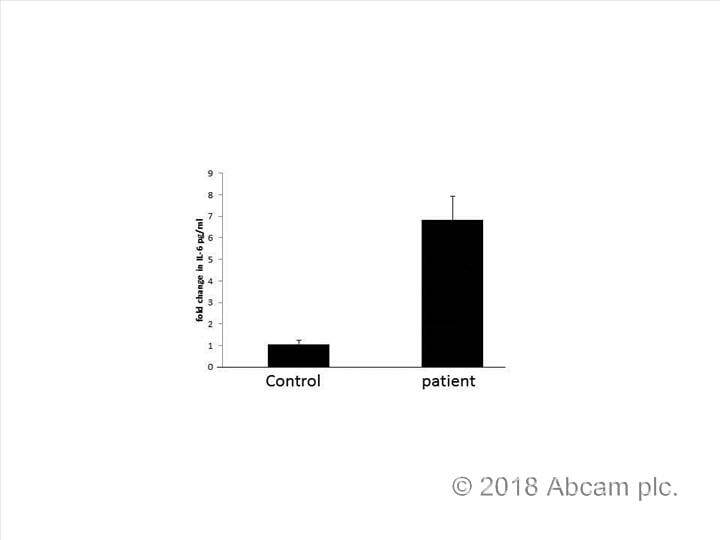 The mean IL6 concentration was determined to be 60,443 pg/mL in stimulated PBMC cell culture supernatant, and undetectable in unstimulated and media controls. Publishing research using ab178013? Please let us know so that we can cite the reference in this datasheet. The association of NOV/CCN3 with obstructive sleep apnea (OSA): preliminary evidence of a novel biomarker in OSA.